A rugged men's brown leather strap watch from Barbour's Beacon collection. Featuring a smart black dial with date window at 4 o' clock, gold tone Arabic Numbers and hands. This casual yet stylish men's watch is designed with a black ion-plated case and fitted with Swiss quartz movement. 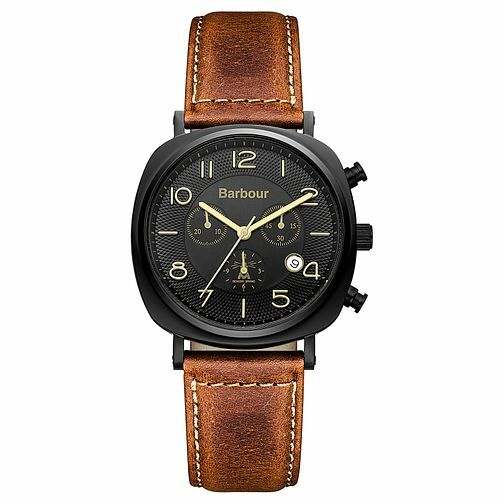 Barbour Beacon men's chronograph brown leather strap watch is rated 5.0 out of 5 by 1. Rated 5 out of 5 by Anonymous from Bargain! Bought the watch in sale - great value and really pleased with it. Looks good on the wrist and comfortable to wear. Would recommend.